What a great time had by all! The dresses! The dancing! Elvis!!!! It was a great night and a wonderful fundraiser for the Playhouse! Thank you to all who came to support us! 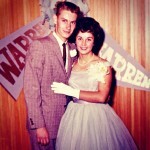 Click here to see some prom pics! Click here to go to ZIP06 for more pics! Our thanks to Rich Cersosimo from Pasta Vita for sponsoring our production of Footloose! 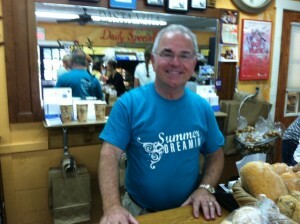 He brought his whole staff to a show last week and wore our “Summer Dreamin’ T-shirt in his shop on Friday – thanks, Rich! The Ivoryton Playhouse Cordially invites you…..
Rewrite your high school history with a prom do-over that’s Almost Paradise! Join us for a prom night to remember on Saturday, July 27. Pre-prom hors d’oeuvres and drinks on the patio from 6:30pm followed by the 8:00pm performance of the smash hit FOOTLOOSE. After the show, enjoy desserts and dancing to the hits from the ‘50s through the ‘80s with local radio personality John “Cadillac” Saville. Curfew will be 12:00midnight. There will be a photo booth, silent auction and a special surprise guest. Hospitality generously sponsored by The Copper Beech, Centerbrook. Other sponsors include: Essex Savings Bank, Outthink, Safety Zone, Connecticut Rental, Tower Labs and Maia and Kay Chiat. Proceeds from Almost Paradise benefit Playhouse programs. Grab a partner, recycle your prom dress, and head up the red carpet to the Playhouse for a prom night that’s fun. FINALLY! For tickets, please call 860.767.9520. Book your seats now for this very special night! To buy tickets on line 24 hours a day: please follow this link. Thank you for visiting the Ivoryton Playhouse!